The ground still trembled as Dirk and Blaze-Simms headed deeper into the ground beneath York. The light of their lanterns cast shifting shadows across what was clearly an ancient tunnel, the floor worn smooth by the passing of feet, the nooks and crevices of the walls heavy with dust. Held up by blocks of mismatched stone and pillars of ageing timber, it had the air of a place built in secrecy with the scraps that could be diverted from elsewhere. Around a bend, the tunnel opened up, leading into a natural cavern. The air was filled with the sound of clattering gears and rushing water. Through the centre of the cavern ran a fast-flowing stream, on which sat a mill-wheel ten feet across. From its wooden housing emerged a series of levers that were pounding at the nearby walls. “What the hell?” Dirk exclaimed, taking in the bizarre sight. Blaze-Simms was already out of the tunnel and heading for the machine, magnifying glass in hand. “But why would a king build some wacky machine under the city?” Dirk followed his friend more cautiously. If there was a machine, presumably there were also people running it. “Well observed,” called out a voice. A dozen people were approaching from the corners of the cavern. Dirk recognised the grey-haired archivist from the town records building and the history enthusiast he’d met at Micklegate. All of them wore pin badges of a silver crown. The men and women beamed with pride. They had the mad expression of those truly committed to a cause, an expression Dirk normally only saw on the most fervent of cultists. “How’s this guarding anyone?” he asked, jerking a thumb toward the machine. Dirk looked across the group. Some of them bore bruises, marking them out as the attackers from the hotel. Many carried clubs or axe handles. They surged forward, this band of misguided monarchists. Dirk set his lamp down and raised his fists just before they reached him. Punches flew and clubs swung as they swarmed over him, trying to drag him to the ground. He kicked one guy in the gut, slammed his elbow into another man’s chest, and head-butted a third. “Dash it all!” Blaze-Simms exclaimed. He’d managed to take down two of his attackers, but another two had gotten hold of his arms and pressed him up against the casing of the machine. Dirk leapt forward to help his friend. As he did so, something collided with the back of his head. He turned, punched, and turned again, then kicked one of the men in his way. A punch hit him in the nose and blood ran free, but he grabbed his attacker by the scruff of the neck and flung him away. Now only the young historian stood between him and his captured friend. She looked down at her injured comrades and then up at Dirk, blood dripping from his face. Her knee shot up, hitting Dirk in the groin. As he doubled over in pain, she brought her clenched fists down on the back of his head. His face hit the floor and the world faded to black. 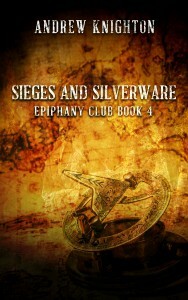 The latest Epiphany Club novella, Sieges and Silverware, is out today! And come back next week to see what happens next in the tunnels under York.